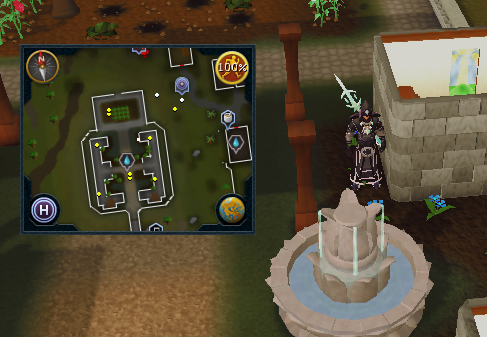 Make your way to the Void Knights Outpost by taking the Void Knight ship from Port Sarim's southern dock. Speak to Commodore Tyr, and he will request your help to track down the fugitive pest with the help of Captain Korasi and Jessika. 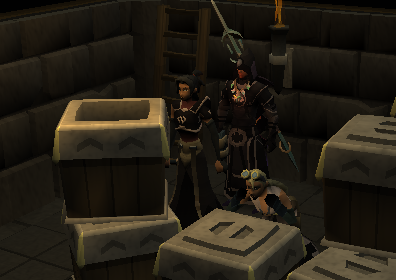 Take the ship back to Port Sarim and travel west a short while to find Captain Korasi and Jessika waiting. Speak with Korasi and she will ask you do to some detective work. Address any of the nearby seamen and they will tell you that they have not seen anything but suggest you talk to Garrant the Fishmonger who has had some barrels knocked over. 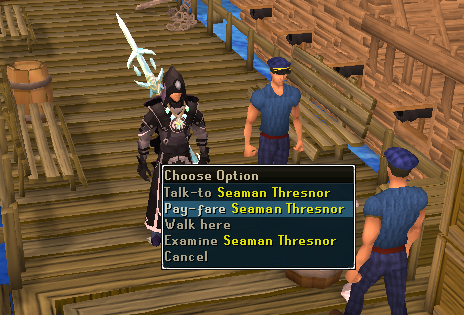 Make your way to the Fishmonger's west of the seamen and north of Wydin's food store and speak to him. He will tell you to look outside. Go outside of the store and there will be some strange, goo-ey, purple tracks outside. Run north a bit following the tracks. You will have to search nearby bushes, logs and stones to locate more tracks like in hunter. Eventually, the tracks will lead up to a burrow in the earth, next to the wall outside the Broken Anchor pub. Return to Captain Korasi and report on what you found, and she will ask you talk to the Bartender. Return to the pub; speak to him and he will tell you the key is somewhere around. Search the most north-eastern pile of junk on the floor to find the Broken Anchor pub key, and then head to the north-western corner and head down the trapdoor. 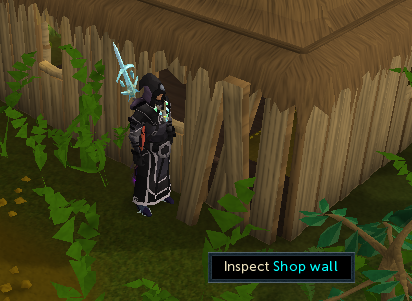 Speak with Jessika who has stumbled upon a odd looking wall. Inspect the wall and you will hack at the wall with your pickaxe (providing you brought one). A purple goo-like substance will pour out of a wall. Jessika will ask you to provide an empty barrel so she can store a sample of the goo for inspection. West of Jessika is a door which leads to another room providing a puzzle for you to solve in order for you to obtain an empty barrel. You'll be provided with a whistle that you can blow. Korasi will explain the different notes you can play that can reset or undo a move you've made. You cannot undo more than once in one go. Provided you know what you're doing the whistle will not be of much use to you. The idea is to kick the barrels out of the way so you have a clear path. Make sure all of the full barrels are the same as the picture below before you attempt to remove the empty barrel. You can try as many times as you like as it will not affect the quest if you fail. Once the puzzle has been solved, speak with Korasi. You will now leave the cellar and arrive back inside the Broken Arrow Pub. Speak to the Bartender, and he will ask about what was going on in his cellar; you can either be honest or lie, and it will not effect the outcome of the quest. You will now return his Cellar Key. 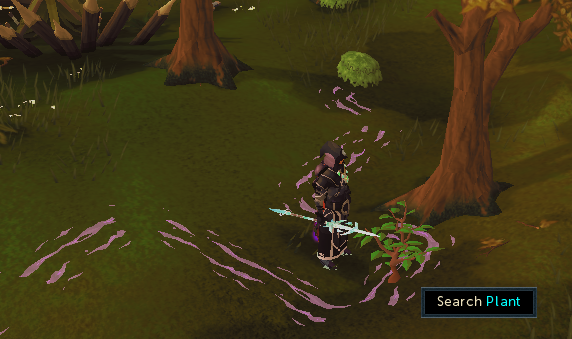 Head back to Korasi and speak to her, to learn that you must now travel to Musa Point on Karamja. To travel to Musa point you will need 30gp and another 30gp to travel back, although optionally you can take a Ring of Charos (A) to travel for free. Speak to any of the seamen to take you there. Once you arrive, head a little west and speak with Korasi. She will suggest you speak with a local bartender. Walk west and speak with Zambo the bartender. Decline his offer to sell you 'Fine wine and spirits' and ask if he has seen anything odd lately. It turns out Kofi who runs the general next door has bumped into a creature that resembled a scorpion. Head to the general store and speak with Kofi. It seems that he is feeling rather lethargic and depressed due to a strange illness which, as you may have noticed, has affected several people already. Make a deal with Kofi that you will fix his wall, and in return, he will show you where he saw the pest. You will need a log, plank, chisel and hammer to fix his wall. You can find everything you need on a table in the south-western corner of the store. Use the chisel on either the log or the plank. It doesn't matter which one as it'll do both together for you. Now use the two pieces on each other to make a joint , and then repair the wall that is damaged. Kofi will then pay up his side of the deal and lead you into the jungle where he spotted the creature. 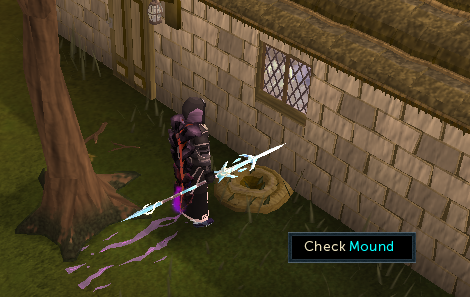 The same purple tracks that you saw in Port Sarim will be here. Search the nearby plants to find more tracks. The tracks vary from person to person, however there are limited amounts of places for it to end up. Keep going until you find the burrow. Jessika and Korasi will then appear next to you and they will talk to you. Investigate the burrow and you will find some waxwood shards in there and you will also notice that it's empty. Jessika will tell you to talk to Rommik the craftsman in the house nearby to the chemist's building where they are waiting. Make your way back to the mainland and travel west to the small village of Rimmington. 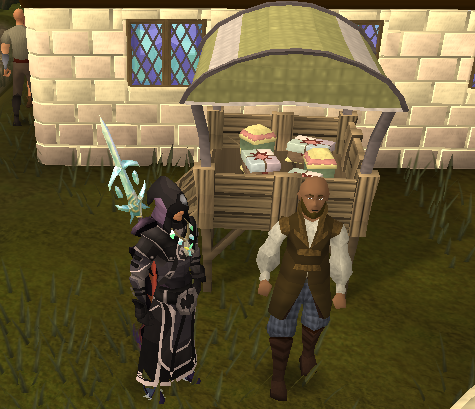 Head to Rommik's shop and speak to him about Waxwood. He will tell you that it is a very ugly wood but it is water proof. He will also tell you that he recently sent off a large order of sealed Waxwood to be sent to a location in Falador, however he knows not who wanted the sealed boxes. Walk west a bit until you reach the chemist's. Go inside to speak to Jessika and Korasi, they will tell you that the goo is ready to be analysed, however neither of them will be any help due to lack of knowledge. Speak to the chemist about the goo and he will tell you that he's got it all ready. When you are ready with at least 16 free spaces in your inventory speak to the chemist and tell him that you are ready. You will be taken downstairs to the machine which looks fairly complex, however is fairly simple if you do it right. Your job is to keep the machine balanced while the chemist analyses the goo. If you fail in this job the machine will explode and sparks will fly. To keep the machine balanced you must keep an eye on the top left hand corner of your screen. The table shows you what you need to do. It tells you whether the heat is too low, too high or okay, and the same for the power. It also shows the overall balance of the machine. It will say ok, caution and warning. It is vital to keep this on ok. Below that it will say what chemical you currently have, and then what chemical it needs to be. On the right there will be another table showing you what chemicals make what. This is needed to make the correct chemicals for the machine. Once the sample has been refined the pest's goo is explained. 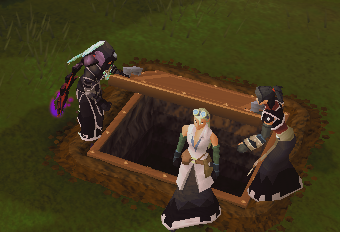 Jessika will offer to teleport the three of you to Falador to settle matters with the white knights. 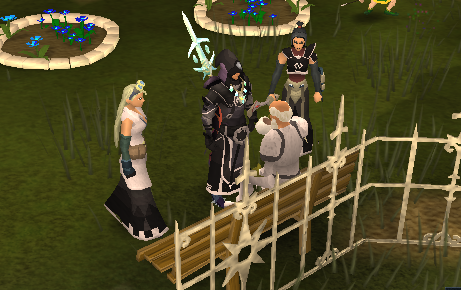 Agree to be teleported to Falador and make your way to Sir Tiffy in Falador park and converse with him. 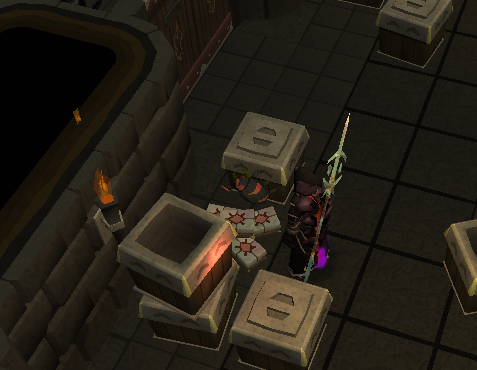 He will tell you about a man south of Falador's east bank that seems suspicious; selling boxes in huge amounts with a puzzle on them to people. Sir Tiffy will tell you that these boxes are made of oak. He will still tell you to go and talk to him to find out what he is up to. 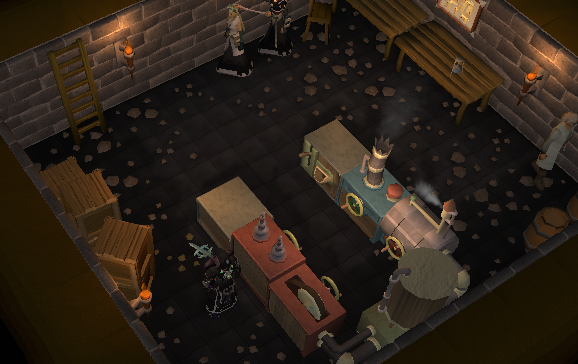 Head to the area behind Falador's east bank and there will be a man named Ali Tist selling strange-looking boxes to people. There are also two ill-looking people next to the bank trying to open the boxes. Address Ali Tist and ask him what he's doing and try to get him to tell you where he sourced the boxes from and what's in them. He will refuse to tell you and states if you want to know what's in them you must open it. Buy one of the boxes off of him for 5gp. Once you have the box, attempt to open it. Your character will then find that it's impossible and makes no sense. Report back to Sir Tiffy and he will attempt to open it. Once everyone has attempted to open it, a conversation about how to open it will begin with you and Jessika. It doesn't matter which options you choose as Korasi will soon interrupt you and grab the box. She will smash the box using the pommel of her sword and goo will pour out. Return to Ali, even though he still will tell you nothing. Report this to Sir Tiffy, and he will tell you to go and get a Search Warrant from Sir Amik Varze who is located on the second floor of the large tower on the west side of the White Knight's Castle. He will scribble a warrant for you, so head back to Ali Tist. Ali Tist will reveal to you that he was given a clue scroll by a man and that he followed it until he came to a cave where he just found the boxes laying around. 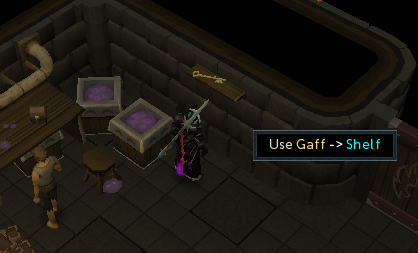 He decided to take them and sell them in Falador and escape before anyone noticed that they were impossible to open. 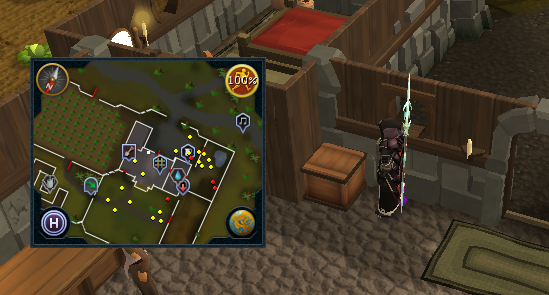 He will hand you a grand clue scroll with a red trim around it. 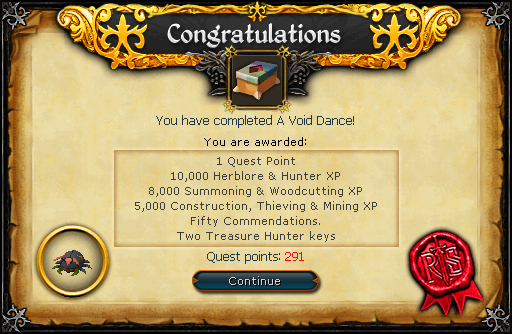 This part of the quest will be familiar to you if you have already tried a Treasure Trail. However the whole treasure trail will be confined to the Asgarnia region. Report back to Sir Tiffy and the party. They'll leave the trail for you to do. 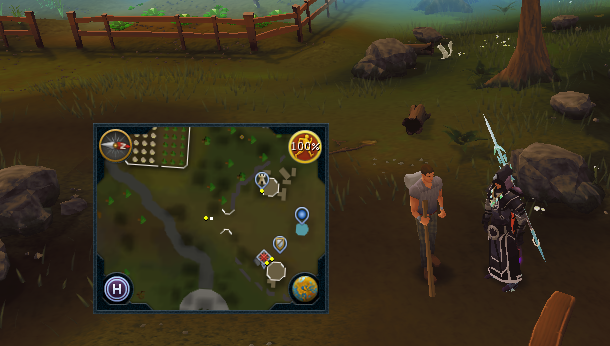 The first clue leads you a grassy area northwest of Falador south of a wheat field. 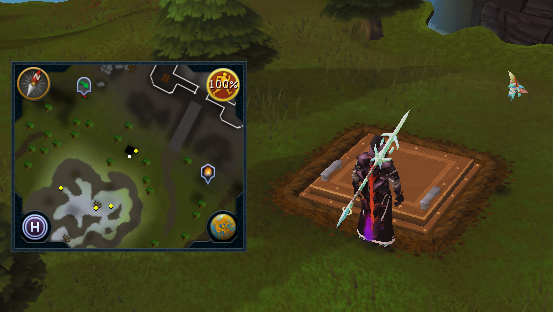 Use a spade to dig for the next clue. 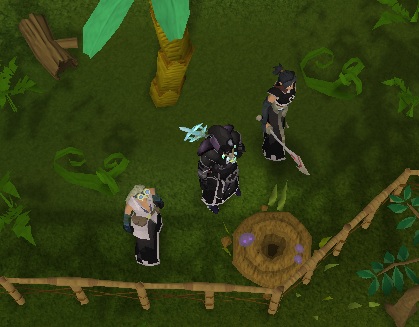 For the next clue you will need an onion which can be obtained from a field next to Melzar's maze north of Rimmington. Head north following the path until you reach a crossroad where a man wanders nearby. Use the Onion with him and when prompted select the wave option. 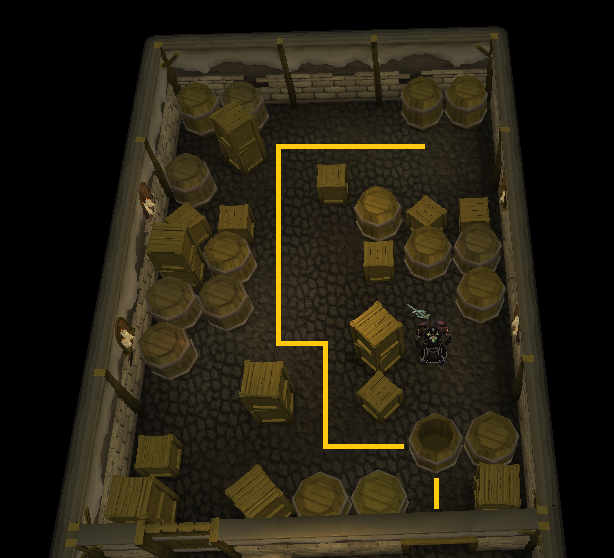 Search a crate in the Falador farm. 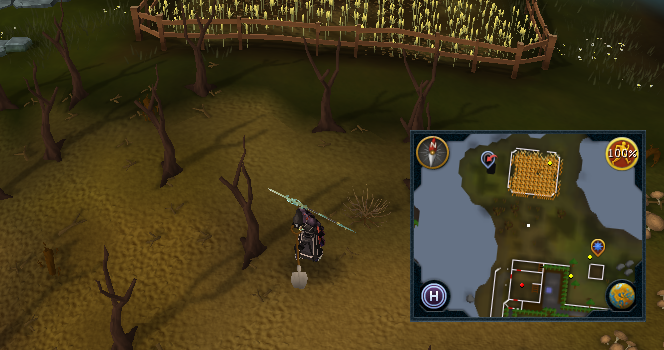 This is west of the crossroads and north of Port Sarim. 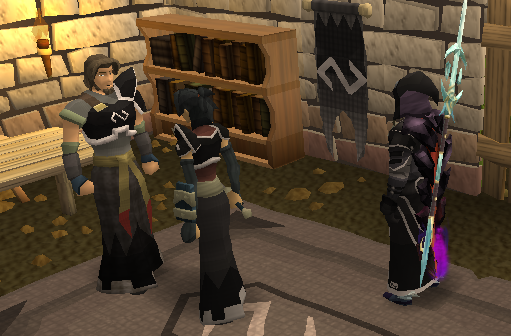 Travel to the monastery west of Edgeville bordering the Wilderness. Dig in the exact patch as shown below. The final clue is south of the Black Knights' Fortress on Ice Mountain. Inspect the large conspicuous looking hatch. Korasi and Jessika will teleport to you to help you open the hatch. Once you are down the hatch you will find yourself sheltered behind some boxes. There will be a guard in the way, so talk to Korasi. She will quickly dispatch of the guard in the way. Speak to her again and she will mention about going through the door at the end of the room. Jessika will say that she doesn't want to kill any more people unless it's needed. Korasi will attempt to enter, however the guard will turn her away as she doesn't have the password. Jessika will have the idea of summoning a Void Drone to listen to one of the workers saying the password. Korasi is not sold on the idea but she agrees. Take the Void Drone and wait for the workers to have gone past. A worker from the south will start walking first and once he is 3/4 of the way across the room a worker from the north door will start walking. If a worker sees you they will take you to outside the trapdoor. You must be somewhere in front of them in order for them to see you. Once the worker from the north has gone through the door, run to some boxes in the north western corner and investigate them. Your character will then place the Void Drone on the boxes, so head slightly west into the corner. A cutscene will play of a worker speaking. When this is over pick up the Void Drone and speak to Jessika. She will get the password out of the drone. Jessika will now try to go through the door, but the guard behind the door refuses to let her in without an identification seal. You must now pickpocket a worker returning with a box to get the ID, so it is a good idea to hide behind the numerous boxes that litter the room. Try to position yourself in the north of the room behind the boxes and wait until the worker with no box has gone in the door. Pickpocket the indentured worker from behind and then return to Korasi and Jessika. It is now your turn, so make your way the door. Once you are at the door you will be safe. No more workers will appear. Once you are through, Jessika and Korasi will run through and capture the guard. You may choose to tie him up and hide him somewhere or kill him. Once you have chosen, make your way through to the next door. Four indentured workers will be in this room with some workbenches. Search the north-western workbench for a strange tool . Use this tool to get two pieces of pipe and a hook from the three other workbenches. The tool will break every time you use it, so you'll have to return the the workbench you got it from to get a new one. Optionally you may murder an Indentured Worker for a tool. Once you have 2 pieces of pipe and the hook use them on each other to create a gaff . Use this on the shelf to retrieve the key . Note: Using Telekinetic Grab on the shelf does not work. 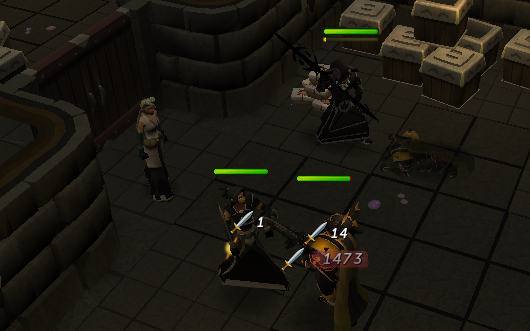 Make sure you are prepared for combat now as you will have to face a level 77 Black Knight Guardian. It would be a good idea to drain your prayer before fighting him, as he will drain your prayer in order to restore his health. Take plenty of monkfish, ideally around 5-10+, depending on your stats. Take good armour and ideally bring a staff or wand and runes to cast water spells as they are weak to them. You could also take a super set or better with you to kill the Guardian faster. When you are ready make your way through the door and combat will initiate. Korasi will take on the one to the left and you will take the one to the right while Jessika stands back. When you have killed yours Korasi will kill hers. You will now see a cutscence of the Void Leech in the machine being drained of its goo. Make a moral decision whether to set the Void Leech free or to put it down. They will now head back to the outpost and Korasi will offer a teleport there. Accept it and speak to Commodore Tyr. You will now see a cutscene of Commodore Tyr speaking to Savant through a CommOrb.